Introduction: Heat-polymerized acrylic resin is used to manufacture almost all denture bases. One of the disadvantages of acrylic resin is its porosity and surface roughness; food scraps attach easily. If the dentures are not cleaned, they become a place for microbial species development and cause denture stomatitis, with Staphylococcus aureus and Candida albicans as the major etiologic agents. Adding nanoparticles of titanium dioxide to heat-polymerized acrylic resin may provide antimicrobial activity to the acrylic resin base. Objectives: This study aimed to determine whether adding TiO2 nanoparticles to heat-polymerized acrylic resin denture base materials affected the amounts of Staphylococcus aureus and Candida albicans. Methods: The samples in this study used heat-polymerized acrylic resin without the addition of TiO2 nanoparticles and with the addition of 2%, 3%, and 4% TiO2 nanoparticles on test bar sizes of 10 mm × 10 mm × 1 mm. There were 48 total test samples: 24 of Staphylococcus aureus and 24 of Candida albicans. The obtained data were analyzed by a one-way ANOVA test. Results: The results showed that adding TiO2 nanoparticles influenced the amount of Staphylococcus aureus (p<0.05) and Candida albicans (p<0.05). A least significant difference test showed differences of effect in the amounts of Staphylococcus aureus when TiO2 concentrations of 2%, 3%, and 4% were added to heat-polymerized acrylic resin denture base and there were differences in effect to amounts of Candida albicans when TiO2 concentrations of 2%, 3%, and 4% were added to heat-polymerized acrylic resin denture base. Conclusion: Adding TiO2 nanoparticles to heat-polymerized acrylic resin denture base material affects the amounts of Staphylococcus aureus and Candida albicans. Razak PA, Richard KMJ, Thankachan RP, Hafiz KAA, Kumar KN, Sameer KM. Geriatric oral health: a review article. J Int Oral Health. 2014;6(6):110-6. Komariah, Sjam R. Kolonisasi Candida dalam rongga mulut. Majalah Kedokteran FK UKI 2012;28(1):39-47. Ritonga PWU. 2015. Pengaruh desinfeksi gigi tiruan dengan energy microwave dan larutan kumur klorheksidin terhadap jumlah Candida albicans pada pemakai gigi tiruan penuh resin akrilik polimerisasi panas. Tesis. FKG USU: Medan. Koopmans ASF, Kippuw n, Gaaff JD. Bacterial involvement in denture-induced stomatitis. J Dent Res. 1988;67(9):1246-50. Minasari, Unita L. Efektifitas ekstrak temulawak (Curcuma xanthorrizaroxb) terhadap pertumbuhan Candida albicans dan Staphylococcus aureus dari denture stomatitis. Dept Biologi Oral FKG USU 2017;1-7. Rahmayani L, Herwanda, Idawani M. Perilaku pemakai gigi tiruan terhadap pemeliharaan kebersihan gigi tiruan lepasan. J PDGI. 2013;62(3): 83-8. Rueggeberg FA. Dental materials for complete denture. In: Rahn AO, et al. eds. Textbook of complete denture, 6th ed., USA: People’s Medical Publishing House, 2006;8-10. McCabe JF, Walls AWG. Applied dental materials. 9th ed., London: Blackwell, 2008;110-23. Ferracane JL. Materials in dentistry principles and applications. 2nd ed., USA: Lippincott Williams & Wilkins, 2001;255-78. Manappallil JJ. Basic dental materials. 3rd ed., New Delhi: Jaypee Brothers Medical Publishers (P), 1998; 94-123. Dwiatmoko S, Kristiana D. Pengaruh komunikasi kesehatan secara lisan dan tulisan terhadap pengetahuan, sikap dan kebersihan gigi tiruan para pemakai gigi tiruan lepasan. Dentika Dent J. 2011; 16(1):14-7. Baena-Monroy T, Moreno-Maldonado V, Franco-Martinez F, Aldape-Barrios B, Quindos G, Sanchez-Vargas LO. Candida albicans, Staphylococcus aureus and Streptococcus mutans colonization in patients wearing dental prosthesis. Med Patol Oral Cir Bucal. 2005;10:27-30. Kuroki K, Hayashi T, Sato K, Asai T, Okano M, Kominami Y, et al. Effect of self-cured acrylic resin added with an inorganic antibacterial agent on Streptococcus mutans. Dent Materials J. 2010; 29:277-85. Sodagar A, Khalil S, Kassasee MZ, Shahroudi AS, Pourakbari B, Bahador A. Antimicrobial properties of poly (methyl methacrylate) acrylic resin incorporated and titanium dioxide nanoparticles on cariogenic bacteria. J Orthod Sci. 2016;5(1):7-13. Song R, Jiao X, Lin L. Improvement of mechanical and antimicrobial properties of denture base resin by nano-titanium dioxide and nano-silicon dioxide particles. Pigment & Resin Technology. 2011;40(6): 393-8. Haghighi F, Mohammadi SR, Mohammadi P, Hosseinkhani S, Shidpour R. Antifungal acivity of TiO2 nanoparticles and EDTA on Candida albicans biofilms. Infect Epidemiol Med. 2013;1(1):33-8. Gao Y, Masuda Y, Seo WS, Ohta H, Koumoto K. TiO2 nanoparticles prepared using an aqueous peroxotitanate solution. Ceramics Int. 2004; 30:1365-8. Shibata T, Hamada N, Kimoto K, Sawada T, Sawada T, Kumada H, et al. Antifungal effect of acrylic resin containing apatite-coated TiO2 photocatalyst. Dent Materials J. 2007;26(3):43-4. Badrodin M. Pemanfaatan nanopartikel perakdan titanium sebagai antikontaminan dalam kultur jaringan tumbuhan. Skripsi. Yogyakarta: Fakultas Biologi UGM, 2015. Safavi K. Evaluation of using nanomaterial in tissue culture media and biological avtivity. Proceding International Conference on Ecological, Environmental and Biological Sciences 2nd in Bali (Indonesia):5-8. Yang JY, Kim HJ, Chung CH. Photocatalytic antifungal activity against Candida albicans by TiO2 coated acrylic resin denture base. J Korean Acad Prost. 2006;44(3):284-94. Anehosur GV, Kulkarni RD, Naik MG, Nadiger RK. Synthesis and determination of antimicrobial activity of visible light activated TiO2 nanoparticles with polymethyl methacrylate denture base resin against Staphylococcus aureus. J Gerontol Geriat Res. 2012; 1(1):1-8. Fujishima A, Rao TN, Tryk DA. Titanium dioxide photocatalysis. J Photochemistry and Photobiology. 2000;1:1-21. Murwani S, Qosimah D, Amri IA. Penyakit bakterial pada ternak hewan besar dan unggas.1st ed., Malang: UB Press, 2017: 265. PUTRANTI, Dwi Tjahyaning; FADILLA, Afrina. Titanium Dioxide Addition to Heat Polymerized Acrylic Resin Denture Base Effect on Staphylococcus aureus and Candida albicans. Journal of Indonesian Dental Association, [S.l. ], v. 1, n. 1, oct. 2018. ISSN 2621-6175. Available at: <http://jurnal.pdgi.or.id/index.php/jida/article/view/286>. Date accessed: 24 apr. 2019. doi: https://doi.org/10.32793/jida.v1i1.286. 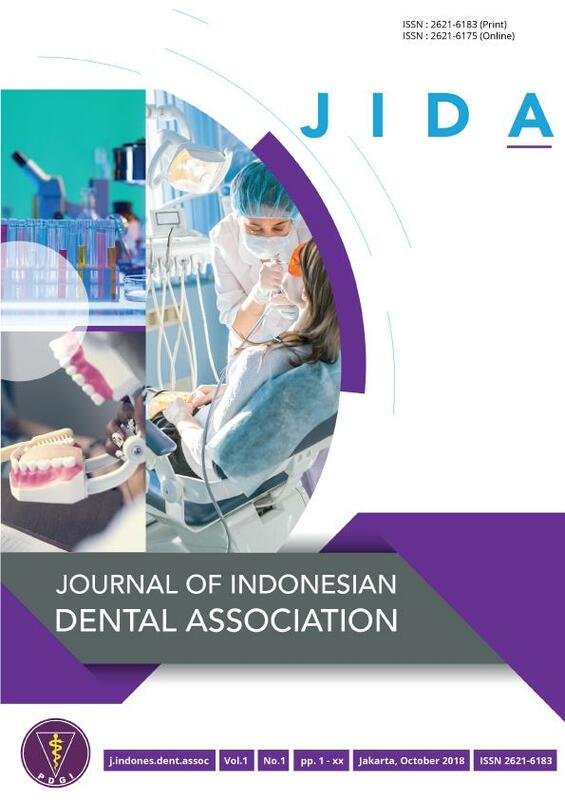 Journal of Indonesian Dental Association Creative Commons Attribution-NonCommercial-ShareAlike 4.0 International License.